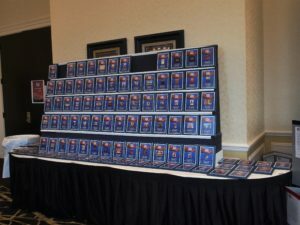 This was my second year attending PrezCon. It’s a bit of a hike from Suburban Philly – especially in the winter. But Amtrak runs right into Charlottesville and that’s a great way to travel. 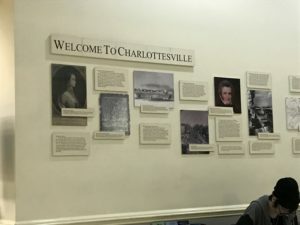 Charlottesville is the home of the University of Virginia and offers some good sightseeing opportunities for those who are interested in Presidential history. I arrived Monday evening and the Doubletree shuttle picked me up at the train station. It ended up being too late to pick up my badge, but I was able to catch up with some friends. The Doubletree Charlottesville is a really great spot for a convention the size of PrezCon. The hotel staff are very well organized and seem appreciative of the convention’s presence. A few employees even seemed interested in learning some games. Besides the shuttle, a pool with hot tub, and the ubiquitous cookie, the hotel also runs a great restaurant. Breakfast offers a large buffet with made-to-order omelets. Lunch and dinner have a tasty menu and you can call in an order and pick it up at the restaurant. There is also a special stand outside the ballroom that offers drinks, sandwiches, pizza, and some special meals throughout the day. In the late evening, 4 or 5 different pies are available. If you have a car at hand, there are plenty of local eating establishments nearby as well as a Walmart. 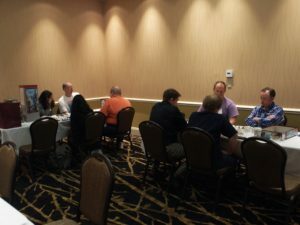 I’m primarily a EuroGames tournament gamer, and the conference room layout works well for that. 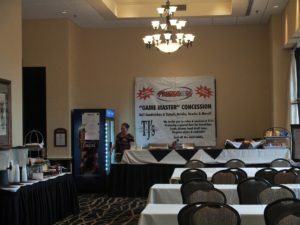 Most tournaments are held in either the large Ballroom, or a few steps away in the Gallery Rooms. The food stand is just outside the Ballroom which makes it easy to catch a quick bite if you don’t have many breaks. The vendors set up in-between while open gaming has a large room downstairs. The convention registration desk is organized and well-staffed for the long hours of the convention. 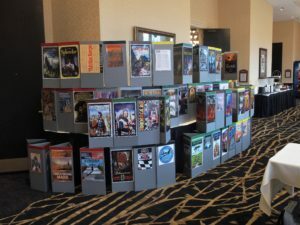 Convention Director Justin Thompson is generally floating around keeping tabs on things, but is easy to find if you need him. PrezCon players are friendly and welcoming to newcomers. 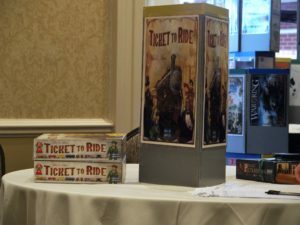 Tournaments at PrezCon award plaques to the final table based on the total numbers of players who participated in the game. 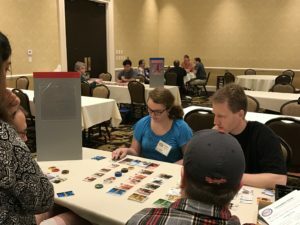 Besides the regular tournament line-up PrezCon also holds several mini-cons during the convention: ColumbiaCon, RevCon, and a EuroGames sampler event. The Agricola and Catan tournaments are both regional championships with winners advancing to a National Championship. PrezCon will also hold a Summer Nationals event in June. Don’t miss out on the opportunity to attend – you’ll have a great time!